An international conference to find a political solution to the conflict in Syria has begun in Switzerland. 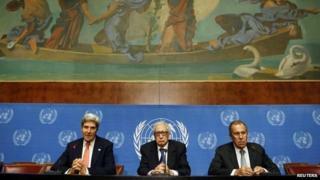 For months, UN, US and Russian diplomats struggled to persuade both sides to attend what has become known as "Geneva II". The UN's Secretary General, Ban Ki-moon, has said it would be "unforgivable not to seize this opportunity" to end a conflict that has left more than 100,000 people dead and driven 9.5 million from their homes. How come a peace conference is being held now? In May 2013, US Secretary of State John Kerry and Russian Foreign Minister Sergei Lavrov agreed to try to "bring both sides to the table" to end the bloodshed. Mr Kerry said the alternative was that Syria "heads closer to an abyss, if not over the abyss and into chaos". However, initial attempts to convene a conference failed. Their initiative gained greater impetus after a chemical weapons attack on the outskirts of Damascus killed hundreds of people on 21 August 2013. On 27 September, the UN Security Council unanimously adopted resolution 2118, which demanded the destruction or removal of Syria's chemical stockpile by mid-2014. It also called for the "convening, as soon as possible, of an international conference on Syria to implement the Geneva Communique", and for "all Syrian parties to engage seriously and constructively" and be committed to the "achievement of stability and reconciliation". What is the Geneva Communique? The communique was issued on 30 June 2012 after a meeting in the Swiss city of Geneva of the UN-backed Action Group for Syria. Is the Syrian government attending Geneva II? Image caption The Syrian government has said it will not negotiate with "terrorists"
The Syrian government announced on 27 November that it would participate in the talks, but added that its official delegation would not be going "to hand over power to anyone". An uncompromising statement by the foreign ministry said representatives were being sent by President Bashar al-Assad to pursue "the Syrian people's demands, first and foremost eliminating terrorism". Officials routinely refer to those who oppose Mr Assad as "terrorists". The ministry also criticised the UK and France for stating that the president had no role to play in Syria's future - also the stance of the main opposition alliance, the National Coalition. In an interview three days before the conference, President Assad said there was a "significant" chance he would seek a third term in office in elections due this June. He also ruled out sharing power with the opposition and called for the Geneva talks to focus on his "war against terrorism". The National Coalition for Syrian Revolutionary and Opposition Forces long resisted calls to commit to participate without a guarantee that President Assad would step down, but intense pressure from its Western and Arab eventually saw it relent on 18 January. A third of the coalition's 119 active members boycotted the vote in Istanbul on whether to attend, and less than half voted in favour. Many boycotters said they did so because they believed the activists and rebels inside Syria opposed Geneva II and rejected the coalition's authority. Its president, Ahmed Jarba, said it had not compromised on its goals. "The table for us is a one-way passage to fulfil all the demands of the revolutionaries, foremost among them stripping the murderer of his powers," he said after the vote. "I assure you that we are not few or weak and we have the free people of the world with us." The biggest opposition bloc, the Syrian National Council, is reported to have subsequently announced that it was pulling out of the coalition because taking part in Geneva II would mean it reneged on its "commitments" not to negotiate until Mr Assad left power. Other prominent groups have also said they will not take part in the conference. The National Co-ordination Committee (NCC) - an officially tolerated internal opposition alliance - announced on 16 January that it would not attend. Its leader, Hassan Abdul Azim, said he had refused to participate as part of a single opposition delegation led by the National Coalition without lengthy preparations. The leadership of Syria's Kurds, who comprise just over 10% of the population, also want to send their own representatives and not be part of the National Coalition delegation. On the ground, the head of the Supreme Military Council of the Western-backed rebel Free Syrian Army said on 26 November that forces aligned to him would not go to Geneva because it had not been made clear that the talks would result in President Assad stepping down. Also, the Islamic Front, a powerful alliance of Islamist rebel groups, has warned it will consider participation in Geneva II as "treason". Iran, a crucial ally of President Assad, was unexpectedly invited to join the start of the Geneva II conference by UN Secretary General Ban Ki-moon on 19 January. Mr Ban said he strongly believed Iran had to be part of the solution to the crisis in Syria. But as soon as it was announced that Tehran had accepted the offer and pledged to play a "positive and constructive role", the opposition National Coalition declared that it would refuse to attend the talks unless Iran was excluded. The US said it viewed Mr Ban's invitation "as conditioned on Iran's explicit and public support for the full implementation of the Geneva Communique". It also noted that Iran had deployed military personnel in Syria and supported the Lebanese Shia Islamist movement, Hezbollah, which has sent fighters to bolster Mr Assad's forces. A day later, Mr Ban rescinded his offer after Iran refused to endorse the Geneva Communique, particularly its call for a transitional government. "We will not accept a precondition that would narrow the solution within set parameters," Deputy Foreign Minister Abbas Araqchi told state television. "Everyone knows that without Iran the chances of a real solution to Syria are not that great," he added. Will the talks be a success? The US called the conference "the best opportunity for the opposition to achieve the goals of the Syrian people and the revolution". However, it is very difficult to see how tangible progress can be made. The two main protagonists have irreconcilable objectives: Syria has repeatedly said President Assad's departure is out of the question, while the National Coalition has made it clear that President Assad must have no role in the transitional governing body called for in the Geneva Communique. Days before the talks were due, Syria's National Reconciliation Minister Ali Haidar said: "Don't expect anything from Geneva II. Neither Geneva II, not Geneva III nor Geneva X will solve the Syrian crisis. The solution has begun and will continue through the military triumph of the state." Even if some kind of political agreement is reached, it will be virtually impossible to implement it on the ground, given that the talks are an irrelevance to most of the major fighting forces.